Portlanders love autumn! From pumpkin spice everything to the return of flannels, beanies, and boots. We also love the cool autumn air paired with the stunning colors of foliage Portland is known for. Late October through mid-November is perfect for viewing the changing shades of leaves throughout the greater Portland area. The phenomenon of the seasonal transition from vivid green hues to brilliant reds, oranges, and yellows is due, in part, to the reduction of chlorophyll as daylight hours decrease. Temperature, weather, and the naturally occurring pigment in leaves are also factors in determining which color leaves will turn. However, they never seem to disappoint. Foliage in Portland puts on quite a show each autumn so we asked a few of our arborist on staff here at ArborPro NW to share their favorite locations for observing fall foliage. Tryon Creek State Natural Area is located about 15 minutes south of downtown Portland. It is Oregon’s only state park within a metropolitan area. It is home to more than 650 acres of forest showcasing diverse plant and wildlife and a spectacular showing of the changing landscape in the autumn. Panoramic views of Portland are a great reason to plan a visit to Mt. Tabor Park in the southeast section of the city any time of the year. However, the foliage Portland has to offer makes it a must visit in the fall. Brightly-hued trees lining the reservoirs, offset by the downtown skyline in the distance, make Mt. Tabor Park an absolute must if you’re looking for the best colors of the season in the city. Washington Park made the list because of the numerous places to visit within the park that provides dramatic contrast between leaves turned earthy shades of scarlet and sandstone set against emerald conifers. Home to the Portland Japanese Garden, Hoyt Arboretum, and the International Rose Test Garden, Washington Park provides endless ways to take in the views the season has to offer. Cathedral Park in Portland’s St. Johns neighborhood is one of the most photographed locations in the city. The architecture of the St. Johns Bridge alone is worth the trip. However, the transformation of the trees beneath the bridge each fall take center stage as they turn from crisp green to various hues of reds and yellows. The picturesque backdrop of the Columbia River adds to the charm of this urban gem. Take in sweeping views of the changing colors along the banks of the Willamette River from George Rogers Park in Lake Oswego. This beautiful park is home to many native plants and shrubs which highlight the splendor of the season as their shades turn. The park provides 26 acres of trails, nature areas, and riverfront access. Fall in Portland is our favorite time of year. So, grab a pumpkin spice concoction, put on your flannel, beanie, and boots, and get outside to explore! If you want to add more color to your landscape each fall, our experts would be happy to help you determine which trees would be right for your property. 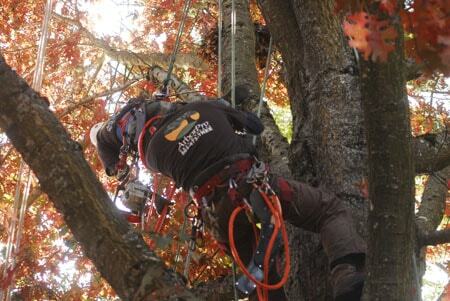 ArborPro NW is your complete tree care company specializing in plant health care, pruning and trimming, and emergency services and hazardous tree removal, serving Lake Oswego and the surround greater metro area.